The finished shade width. Include molding in width for external mounting. 3-inch (77.2 mm) is automatically added to facing material for edge finishing. 2-inch (50.8 mm) is added to the lining fabric. The finished shade height. Not including top and bottom hems. A rough indication of the desired depth of the top-most fold in the shade--the "valance". Normally between 2 and 8 inches (50 and 204 mm). A 2 inch valance will result in a "child safe" shade system. The actual depth of this fold as well as the total stack height of the retracted shade will vary due to rounding and depending upon battens and hardware used. Total number of shades with these dimensions. The vertical repeat of a patterned fabric. 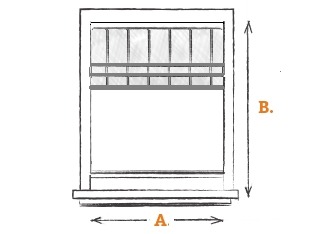 Needed if quantity is greater than one or curtain width exceeds fabric width. Decimals are permitted.